Posted by Landry Shorkey on February 13, 2019 in News, Top Stories. Ferris criminal justice sophomore Phil Marsalese believes he’s received unfair treatment from Ferris Department of Safety (DPS) regarding a slew of tickets he received last October. Marsalese claims to have received three parking tickets for leaving his car in Lot 21 over a weekend. He parked in the correct lot, but his permit sticker had fallen off his windshield. “I did a whole two-page paper on how I felt like it was wrong. They gave me a phone call. They said, basically, that the board rejected my appeal and that I’d have to pay it, so I ended up paying it,” Marsalese said. He was about to receive a fourth parking ticket for unlawful display of his sticker when he returned to his car, Marsalese said. 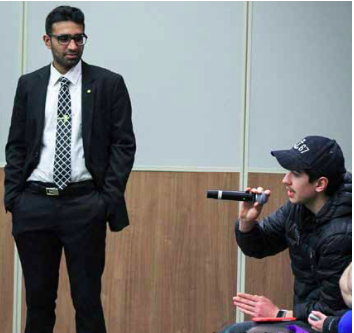 Marsalese was but one student among many voicing concerns and airing their grievances at the Student Government Association (SGA) 2019 Student Issues Panel. The discussion Tuesday, Feb. 5, in the University Center, was previously an annual event until 2018 when it was canceled due to scheduling conflicts. The policy on parking citations was explained by Ferris DPS Dispatch Specialist Dylan Tantalo. Students who experience a problem on campus are welcome to attend an SGA meeting 6:30 p.m. Tuesdays in UCB 202. The SGA can also be contacted through email or Facebook. The panel consisted of Interim Chief Technology Officer Ralph Williams, Vice President of Administration & Finance Jerry Scoby, Dean of Student Life Joy Pufhal, Vice President of Student Affairs Jeanine Ward-Roof, Associate Vice President of Auxiliary Enterprises Gheretta Harris and Ferris State Department of Public Safety Dispatch Specialist Dylan Tantalo.